I still use this Kerr Kitchen Cookbook, published in 1990. I think the recipe combinations are more sophisticated than the current Ball books, and they give lots of good recipes using the canned or frozen foods too. It appears to me that cooks in the last generation were less afraid to use spices like allspice, and perhaps they were more common than now – I had to go to an Amish grocery to find whole allspice. If you like to can and you want more than just plain stuff, try one of these older canning books. I’m not inclined to use my oldest canning books unless I've up-dated the methods, but I do think the recipes are better as far as seasoning goes and it's a good way to get new-old ideas for combinations. This book is excellent, current in it's methods, and you can see my copy is well-worn. 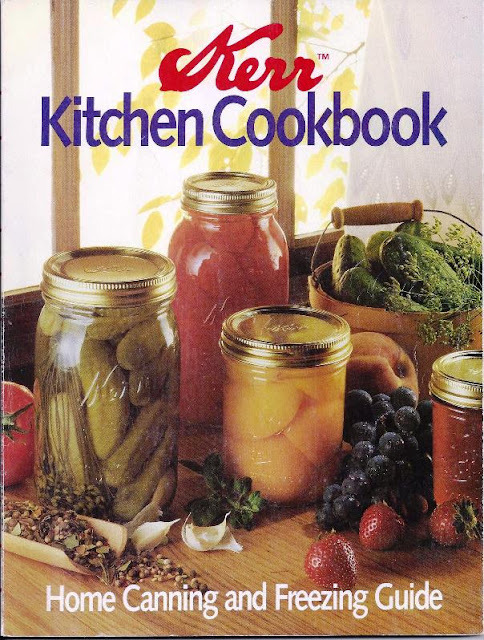 I especially like the serving suggestions scattered throughout the book, showing you how to use your home-canned goods. Here are a few recipes we use and like from this book. I'm new to canning having just started in September, and I'm addicted. I would love to have this book. Can you tell me where I can purchase or find it. I have the current Ball book but would love this one too. Thank you and have a Blessed CHRISTmas! They sell this used on Amazon and Ebay, but I almost fainted at the price! My best suggestion is to look at antique shops, shows, antique malls, flea markets, and yard sales and used book sales where they often put out these old books for a few bucks.